It's excellent if you exercise, watch your weight and don't drink or smoke; but if you're living in solitude, your health may suffer despite taking care of yourself! Loneliness can ruin the body like physical stress. Researchers believe that social isolation and feelings of loneliness may trigger inflammation and damage the immune system. Loneliness has been shown to speed up changes in the heart. Loneliness has a number of negative effects on mental and physical health. Lonely individuals tend to get insufficient sleep; their diet is high in fat, and they experience daytime fatigue. 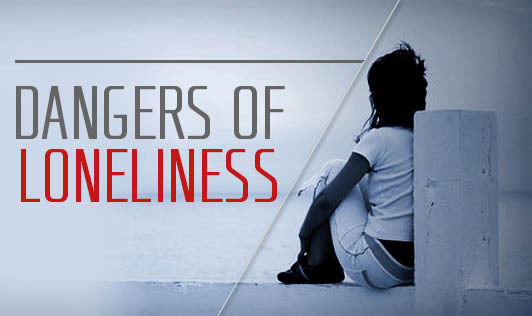 Loneliness also disrupts the regulation of cellular processes deep within the body, predisposing one to premature aging, says John Cacioppo, co-author of the book "Loneliness: Human Nature and the Need for Social Connection". 1.Identify that loneliness is a sign that something needs to change. 2.Realize the effects that loneliness has on your life, both mentally and physically. 3.Focus on developing quality relationships with people who share similar attitudes, interests and values with you. 4.Consider doing activities that you enjoy. Such situations present a great amount of opportunities to meet people and cultivate new relationships. 5.Lastly, expect the best. Lonely people often expect rejection; so instead, focus on positive thoughts and attitudes in social relationships. "Note that the key is in the quality of relationships and not the quantity of people!"